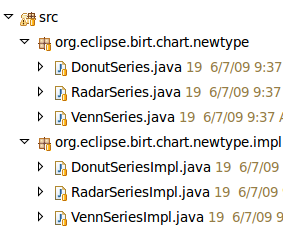 Difference between revisions of "Adding new advanced chart types in BIRT"
[http://code.google.com/p/eclipse-soc/source/browse/#svn/trunk/2009-newBirtCharts Here] you can find the repository and additional information. Making plans for creating new chart types. Which classes have to be created. 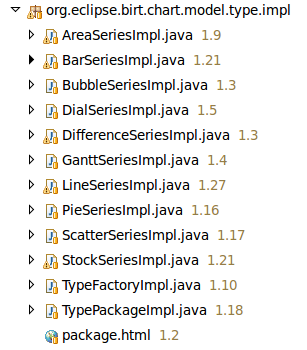 || As you can see in the existing birt code, there are two packages for a chart type. So the next step will be creating classes and interfaces for all the three new chart types. As there are almost every classes are located, there will be an information left how to create a new plugin, extending existing BIRT code without patching any line of code. For example, the PIE chart will be rendered in die generator.render-phase. This is a hard coded piece of BIRT. But the question will be how to insert new chart types. List every class which has to be implemented. Clear how to combine new chart types with extension points of existing BIRT Framework. My project for this year's Google Sommer of Code will be to contribute new chart types for the BIRT project. As there were some request about new chart types for BIRT the goal of my project is to add three new chart types. BIRT already provides several chart types for designing customs reports. I found some open bugs and help-wanted entries in bugzilla. This chart will be implemented based on the existing pie chart. This chart shows data information grouped by categories. This chart shows similarities and differences of several datasets. Here you can find the timeline for this project including all milestones. June 07 Getting organizational things done like SVN repository etc. June 10 Creating base frame for all three chart types. M1 Source code is hosted at google code for eclipse foundation project. Later it will be integrated in BIRT. Here you can find the repository and additional information. Which classes have to be created? M2 If you have a look at source located like it is in M1 descripted, you see that now that are an interface and an implementation class. 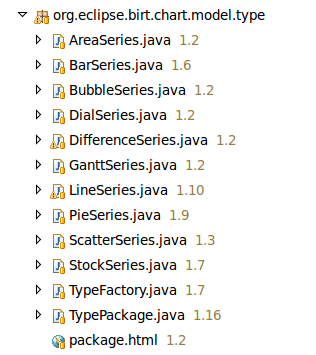 Next step will be to locate all required classes. Therefore you can decide how to create a new chart type. I'm proud to take part in GSoC 2009. As it is my first project I'm happy about every help.